$11.95 In stock. Order in the next 3 hours, 53 minutes and it will go out today! Designed by Adrian Valenzuela, and created by Chris Ramsay, the original Memento Mori deck has quickly become a best seller and is one of the most recognizable custom decks of the modern era. 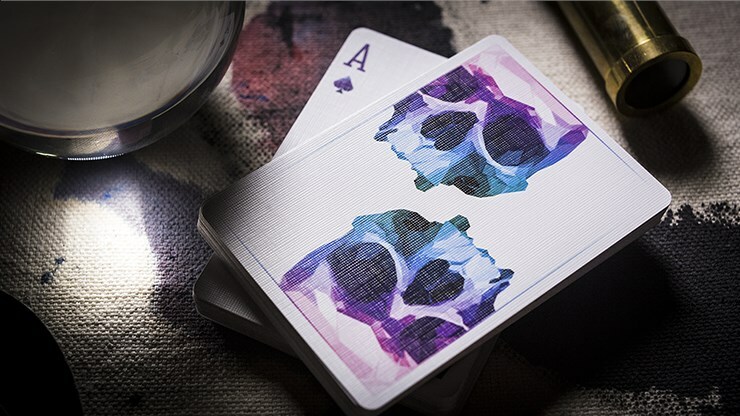 As proof of its popularity is the fact that several popular gaff decks are now available with the Memento Mori artwork (e.g. Svengali, Stripper, Invisible, One Way), and a separate Blue version has also been produced. Now artist Adrian Valenzuela has taken the Memento Mori deck to the next level, with what is effectively its third generation, named Memento Mori NXS (Nexus) deck. The tuck box looks immediately familiar and yet different from its predecessors. 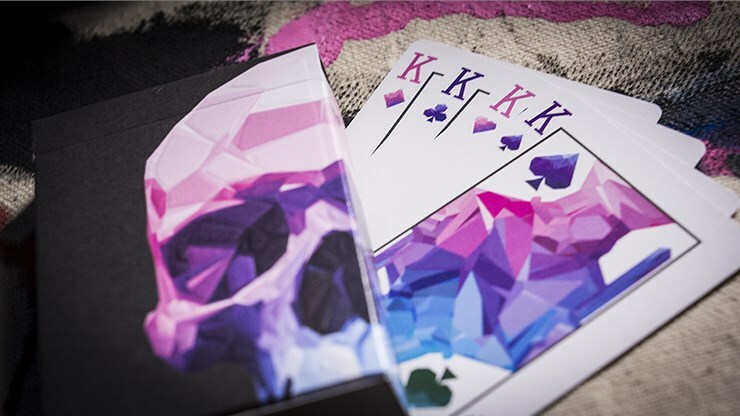 Against a matt black back-drop is a skull in the signature pink and blue colours of the Memento Mori deck, arranged as an embossed mosaic with a wrap-around design. 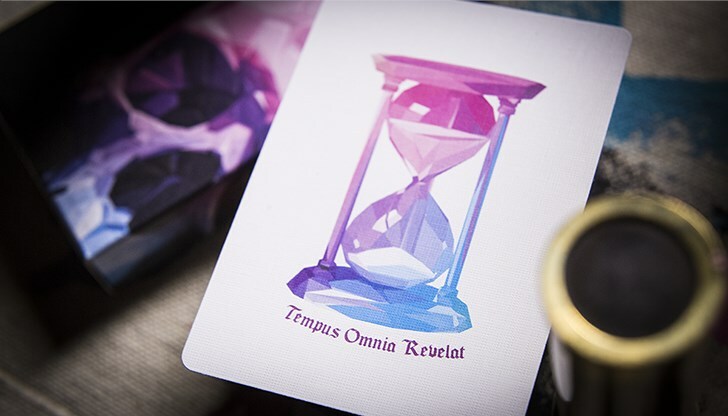 The concept of the Memento Mori decks is "remember your mortality," and with this new deck, we are encouraged to use our mortality as a stepping stone to achieve success in life, by turning clumsiness into precision, failures into knowledge, frustration into breakthroughs, struggle into resilience, and boundaries into creativity. 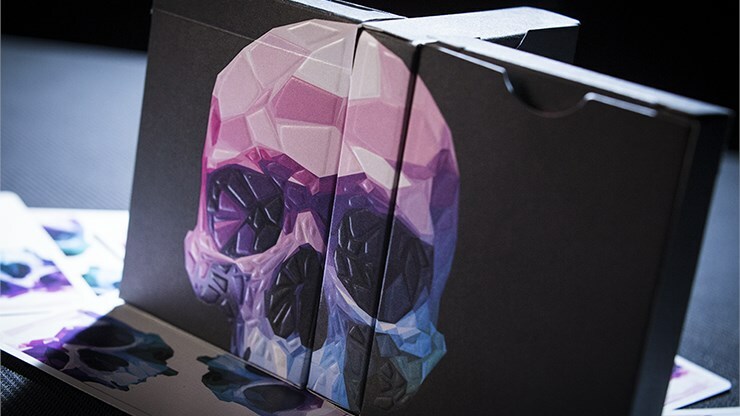 Unlike the original deck, the card backs no longer have a low-poly look that disguises their skeletal forms, but these now have artwork that looks more obviously like traditional skulls. The design still does appear on opposite corners, however, giving possibilities for interesting visual effects with fans and springs. 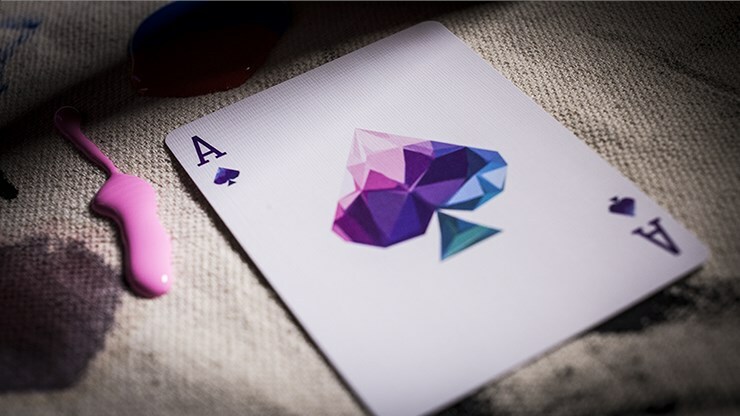 The court cards consist of the familiar low-poly design emphasizing geometric patterns and colours. The artistic design here is virtually identical to the original Memento Mori decks, but with a slightly adjusted colour scheme. While the original Memento Mori decks featured purples, blues, greens and yellows, and the Memento Mori Blue deck opted exclusively for shades of blues, the Memento Mori NXS takes the middle road by eliminating the greens and yellows of the original, and going just with purples and blues. For the rest, the style is what we have become familiar with from the previous deck. The style of these cards is very clearly geared to visual aesthetics rather than serving as a practical deck for card games, and will perform best when in the hands of a capable cardist. The two Jokers are quite striking, both picturing an hour glass, which fits of course with the deck's theme about mortality. One is accompanied with some Latin to remind us that Time reveals everything ("tempus omnia revelat"). The other has the same artwork, but has a "Seven of Spades" card reveal in mirrored writing. 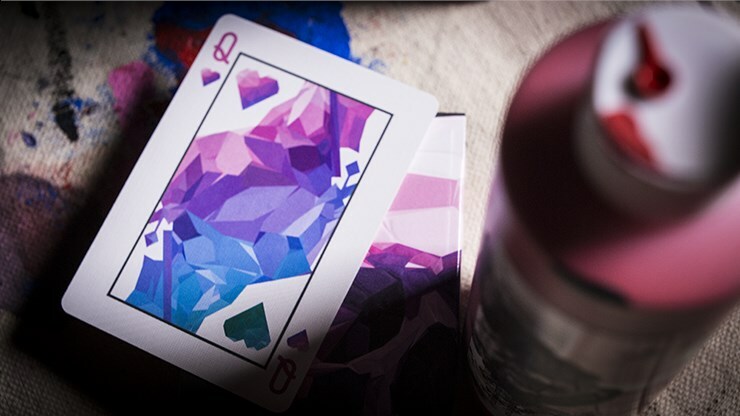 There's also two gaff cards, a double backer, and a Queen of Hearts / Seven of Clubs split card.